American Zombie: How can I save my little boy from Oppenheimer's deadly toy? How can I save my little boy from Oppenheimer's deadly toy? "Now, I have become Death, the destroyer of worlds." 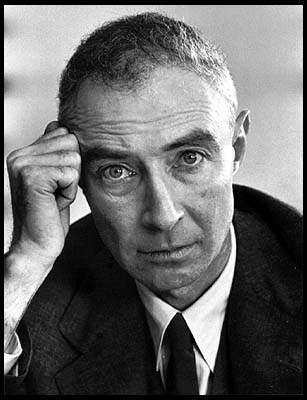 Those were the words that ran through the mind of J. Robert Oppenheimer on July 16, 1945 shortly after the Trinity explosion lit up the New Mexico desert. The words came from the Bhagavad Gita and were originally attributed to Vishnu, a manifestation of "God" (Krishna) in Hinduism which represents destruction...quite often on a cosmic scale. It was an apt thunk. In under 4 years, Oppenheimer and his incredibly talented brain trust which composed the Manhattan Project took a purely theoretical concept: the possibility of a neutron driven chain reaction, and turned it into a physical reality. Some would argue it was the greatest scientific/engineering accomplishment of the century...possibly ever. An entire city was built from scratch in Los Alamos in under a year. The Army Corps of Engineers built the city under total secrecy. It housed a compendium of intelligentsia the likes of which this country had never seen before and hasn't seen since. Teleologic misgivings aside, it was a herculean accomplishment. In my opinion, it even dwarfed the moonshot. Among Los Alamos' first residents was Hungarian physicist, Leo Szilard, the true "thinker of thunks" who first proposed the possibility of a neutron-driven, fission reaction which could release more energy than was required to initiate it. Most folks think Einstein was the first "neutron" which split the minds of men...setting off the chain reaction of government and scientific cooperation which lead to the Trinity explosion. In a relative manner, it was actually Szilard with the help of Enrico Fermi, who served as the catalyst for the Manhattan Project. Einstein was actually used as a figurehead to draft a letter to F.D.R which "enlightened" him to the possibility of an atomic "super weapon". Scientific American has a great essay which can be purchased online that details how Szilard spent an entire afternoon wrestling with Einstein and his conscience; persuading him to write the letter to Roosevelt which would instigate the beginning of the Manhattan Project and ultimately lead to "Little Boy" being dropped on Hiroshima on August 6, 1945. When I worked full time for the Smithsonian, I was asked to videotape the 1995 Enola Gay exhibit at the Air and Space Museum before it's official opening for security purposes. I actually stood in the fuselage of the plane, right where the bomb hung before it was released...I still get goosebumps thinking about that. As I write this, I am sitting in a hotel in Oak Ridge, Tennessee. Oak Ridge along with Hanford, Washington were the first American sites to enrich Uranium-235, the fuel which powered the first nuclear blasts. Post WWII a plant was built on the Ohio River in my hometown of Paducah, Kentucky. This is where the uranium was (and still is) sent by rail from Oak Ridge to be enriched into the plutonium which rests in over 90% of our nuclear warheads today. The Paducah plant is a story unto itself, but I will save that for another post. As I was driving down I-81 today, I was listening to NPR which was reporting the recent North Korean nuclear test and the impending threat the rogue country poses to the civilized world. It made me think of Oppenheimer's reference to Vishnu after the Trinity blast. It also made me think of another myth from Yoruba Cosmology which I think is even more apt than Oppenheimer's mythic analogy. I give you the story of the Yoruba deity, Ogun, in part 2. I was born and lived my early childhood in Alamogordo. It's weird to think that happened right there. My uncle was a teen at the time, living in Ruidoso in the mountains. He told me he witnessed the fireball - of course, no one knew what it was. I love New Mexico....Southwest in general. We probably share something in common...we were probably both exposed to high levels of radiation as children....the Paducah plant contamintated the whole area. I lived about 20 miles from it until I was 18. Inherent in the nature of invention is not knowing exactly where one's invention might lead. Of course, there is also the Savannah River Site. While I am Atlanta born, I grew up in Huntington, WV. Between the drive from home to home and my years spent working on MississippiRiverLand Airlines' planes (not its real name;), I have been blessed with spending a fair amount of time in Paducah. Lovely spot. you're gonna love Ogun's story. Paducah lovely? hmmm. I guess it has it's own special charm. The downtown area is great. Beautiful. And you quoted one post-Police Sting song that I actually like, probably because Prokofiev wrote the melody. your post is awsome cant wait for part two !!!! !